A few hours each week I take off my "mom hat" to teach water aerobics. One of my goals when teaching this group of adults is to try to incorporate a little fun (while still working hard) into each class. 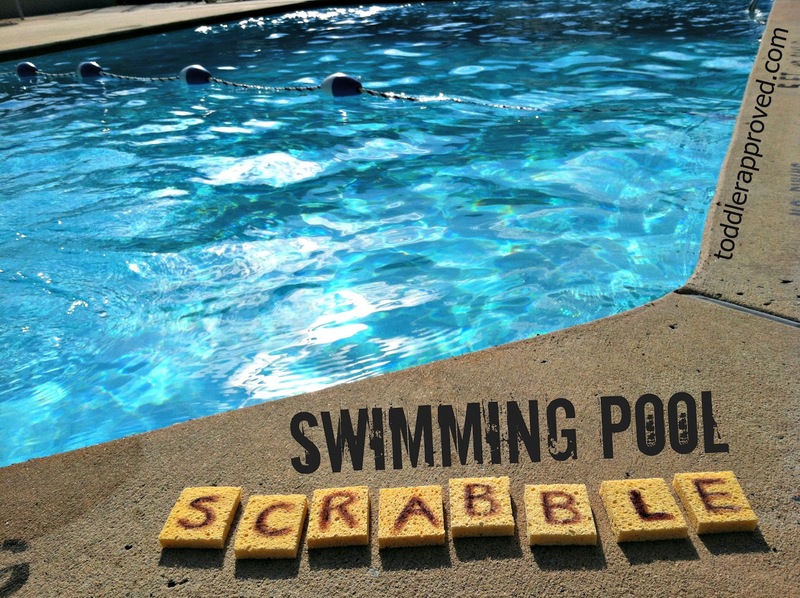 Today I'm sharing one of my class favorites, (Swimming Pool Scrabble), and showing how to make it age appropriate for your children. 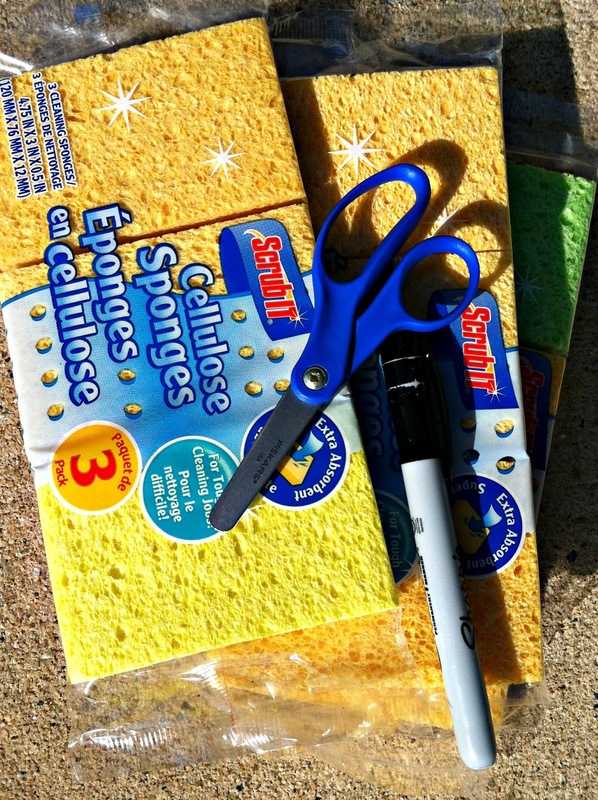 Cut sponges in half. Write letters on each sponge (we only put letters on one side, but you can easily make these "tiles" double sided to give you more spelling options). Throw the "scrabble sponges" in the pool, then swim to collect all of the pieces. 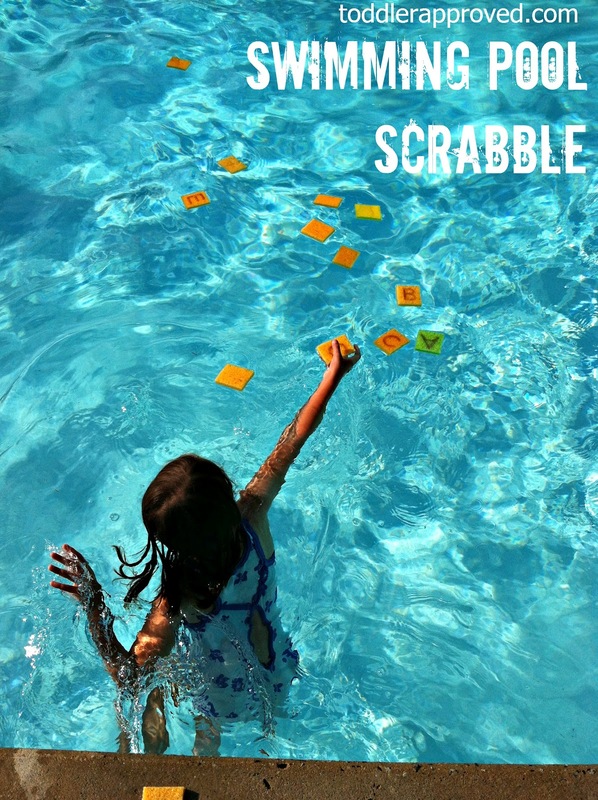 Both of my children are still learning to swim - so instead of making it a competition, we worked together to collect all of the pieces, or would take turns swimming out to grab a letter. Once collected - play an age appropriate game of scrabble. With my 3 year old, we worked on putting the letters in alphabetical order, and finding the letters that made up his name - with my 5 year old, we'd see how many simple words we could form using the letters she had collected. Throw them back in and start over again. 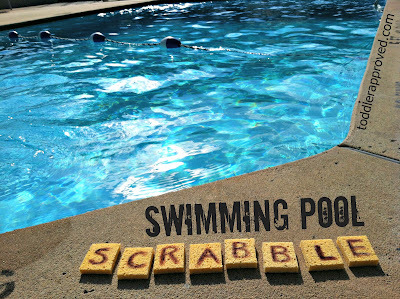 In addition to being a fun and active way to play with letters, this game provides an excellent way to improve stroke technique/efficiency (by having to reach for the letters) without seeming like "swimming instruction". What are your favorite pool toys/games? What a brilliant idea - I love it! So much wonderful learning can be achieved with this activity because it reaches tactile, kinesthetic and auditory. Love it! Oh this idea is awesome! We have a pool in our backyard and I bet my kids would love this. I wonder if the foam sheets would work too? Well now, that is a super cool idea! Going to do this with my kids this summer. LOVE THIS! I'm going to do this with my son, he's been going to swim lessons regularly, this would be an awesome game for building on his confidence even more! Adorable idea! Can we come play with you? What a great idea! My kids will LOVE this. Thanks so much for sharing it on this week's Kids Co-Op Linky! This is a pretty awesome idea!! What a fantastic idea! I have included this in my 5 Great Finds: Fun things to do with sponges. I hope it is ok to use a photo to go with the link back to your blog. What a creative and fun idea! I might do this for our youngest niece ;). Ooooh, I love this!!! So creative! I am all over this. Thanks so much for sharing. I look forward to looking through your blog, as I have a just-turned-one-year-old, and I will take all the ideas I can get :) Stopping by from Hoyby Crafts. I am definitely doing this? How long do the sponges last? do they get ycky after a while?